Yesterday’s candle on the yen to dollar daily chart merely confirmed what we already know, namely that it is impossible to predict the direction for the pair at this stage. The candle indicated a day of indecision with an upper wick, a narrow body which closed marginally above all three moving average. However, these technical indicators have virtually lost all meaning in the current chart given that they are either crossing or bunching almost at random as a result of the sideways consolidation. The trend, if it can be called that, still remains mildly bearish from the high of March as the pair continue to slide ever lower towards the 94 price level which has now become a defining area of support in the current move. 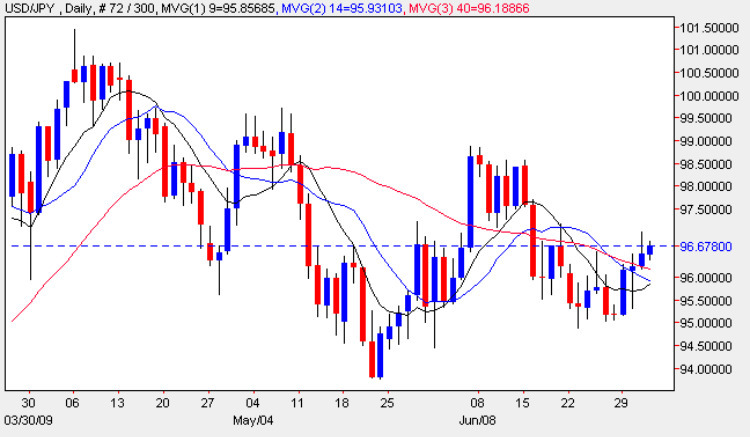 Whilst we have the NFP release in the US later today, given the Japanese Yen’s status a safe haven currency, the impact may be somewhat muted when compared to the volatility exhibited in the other majors, so this may not be a defining day for the dollar yen.